Asimov's well-written column and corresponding blog post, both of which were published on April 12, 2010, review Mosel Kabinett Rieslings, an overlooked—or, at least, underrated—style of wine that is increasingly difficult to produce owing to climate change. In the past two decades, the ripeness, or must weight, of Riesling grapes, which is measured in degrees Oechsle, has typically exceeded the minimum level for Kabinett at least for quality-oriented growers. One 2008 that did fit Asimov's notion of genuine Mosel Kabinett was the Brauneberger Juffer Sonnenuhr from Fritz Haag, "which showed gorgeous precision and balance." His other "favorite Mosel producer" is Joh. Jos. Prüm, but nonetheless the panel rejected the two Kabinetts from this venerable Middle Mosel estate. This didn't particularly surprise him as J. J. Prüm's Rieslings generally need bottle-aging owing to the sulfury smell of "just-struck matches"—though this seems to be more reductive, sponti aromas than merely elemental sulfur and less problematic in recent vintages (see "What's the Stink?"). Additional 2008 Kabinett Rieslings that he found very good were Eitelsbacher Karthäuserhofberg from Karthäuserhof and Kanzemer Altenberg from von Othegraven, in the Ruwer and Saar valleys, respectively. The wine panel's top ten also included Kabinetts from Willi Schaefer, Selbach-Oster, and Zilliken, all three first-rate producers. Some of the many other 2008 Mosel Kabinetts that didn't appear in the panel tasting but deserve special mention include Enkircher Ellergrub from Weiser-Künstler, Ürziger Würzgarten from Jos. Christoffel jr. (not to be confused with the better-known Joh. Jos. Christoffel Erben, also in Ürzig, and leased to Mönchhof since 2001), and Scharzhofberger from Egon Müller, even if, over the years, some skeptics feel that the real quality at this renowned Saar estate starts at Spätlese. In addition, a couple of the top Saar producers—even those who make some alcoholically delicate Rieslings (Loch/Weinhof Herrenberg, Peter Lauer)—no longer use the designation Kabinett (about which, more later). It’s worth noting, as well, that Joh. Jos. Prüm and Egon Müller focus, almost entirely, on making fruity to nobly sweet wines and almost always render more than one bottling of Kabinett. 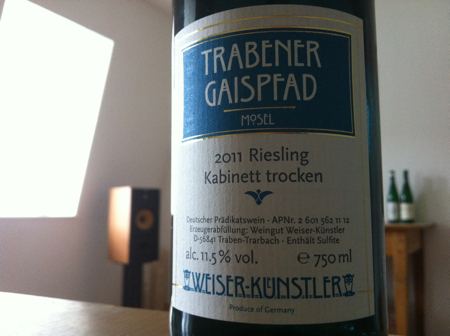 Weiser-Künstler, however, produces not only very good sweet wines but also dry ones, including a light, zesty Riesling Kabinett trocken from the relatively unknown Trabener Gaispfad (see photograph). Today, most Riesling Kabinetts are actually Spätlese and—more often than not—Auslese wines, because there is no maximum Oechsle limit for each predicate. Even so, the best producers look at the type of fruit and not just the must weight in deciding among Kabinett, Spätlese, and Auslese. Nonetheless, these riper Kabinetts have impressed many wine journalists and drinkers alike. Yet many of them have begun to long for the light-bodied wines of the past. As in Asimov's article and blog post, the lack of "real" Kabinetts has been discussed elsewhere. Most recently, Mosel Fine Wines, an independent review of Mosel Riesling by Jean Fisch and David Rayer, took up this issue by writing "a plea for true Kabinett and Spätlese" in July 2012: "If there is one thing which Mosel can and others cannot (or much less so), it is to produce light and fresh fruity styled Kabinett and Spätlese wines. In fact, for many wine lovers, especially outside Germany, this is what Mosel wines are all about." In the same month, the German wine writer Stephan Reinhardt, who has a new book titled The Finest Wines of Germany, also wrote an appeal on behalf of Kabinett in the Süddeutsche Zeitung. All the same, many of the critics who speak out for light and fruity-styled Mosel Rieslings still rate those riper Kabinetts, with often more than 50-plus grams of residual sugar, among the best. According to the veteran wine critic David Schildknecht, "Arguably fashion and the belief that lower yields would mean better wine led to creeping must weights among Riesling Kabinetts—at least, at top addresses—throughout the 1980s and 1990s; whereas it is arguably only in the past 20 or so years that one can speak of its being genuinely difficult to generate a Kabinett-light wine due to climatic impingement on ripening patterns." Most vintners agree that 1987 was the last less ripe vintage. Since then, must weights have steadily gone up. For years, Schildknecht has been a strong advocate of light, off-dry Rieslings, those "in that 10–40 gram no man's land which for decades prior to the 1970s, a majority of German Rieslings (even those referred to as 'dry' or as 'Auslese') inhabited." Most producers focus more on either legally dry or overly sweet Kabinetts, rather than off-dry. Reinhardt also argues, with good reason, that the off-dry style of Kabinett—usually either labeled halbtrocken or feinherb—is overlooked, even in Germany, and tends to be neither too high in alcohol, as some dry Kabinett Rieslings can be, nor too sweet, as is often the case with many fruity Kabinetts. Even so, an off-dry, low-alcohol Mosel Riesling does not necessarily result in an elegant wine with better balance than one fermented below 10 grams of sugar. In the early 1970s, Kabinetts that were halbtrocken, between 9 and 18 grams of sugar, seldom had the term on the label. Moreover, the wines were lighter than today. What is missing in the usual discourse surrounding Kabinett is an explanation of the term and a description of the full range of styles of Kabinett Riesling produced in the Mosel region, or, for that matter, in the Nahe, Mittelrhein, Rheingau, Rheinhessen, and Pfalz. For most wine connoisseurs, Kabinett, especially from the Mosel, is a light, thirst-quenching wine with a touch of sweetness. In The Wine Atlas of Germany (Mitchell Beazley, 1995), Stuart Pigott writes, "[Mosel Kabinetts] are the best naturally light—that is, low-alcohol—wines in the world, with an extraordinary amount of fruit, character, and elegance for only 7–9 degrees of alcohol." Among German wines with a predicate, Kabinett has the lowest ripeness level (up from 70 to only 73 degrees Oechsle in the Mosel) and, as stated earlier, can be fermented dry, off-dry, or sweet. In other words, two scales exist, one indicating minimum ripeness of the grapes at harvest, and the other measuring the residual sugar in the finished wine. This was the case from the outset of the 1971 Law, which also created the terms for "dry" (trocken) and "half-dry" (halbtrocken). The legally undefined term feinherb—best translated as "finely bitter"—first appeared in 1998 on the labels of Reichsgraf von Kesselstatt for their Rieslings from 9 up to 15 grams of sugar. It was later contested by the regulatory authority in Trier, as "any information that is not required on the label is prohibited from appearing there." In 2002, the authorities permitted the use of the term "feinherb." Since then, a number of producers have preferred to substitute feinherb for halbtrocken, such as Maximin Grünhaus and Weingut Stein, especially for Kabinett, although most still use feinherb to designate Rieslings which have somewhat higher residual sugar than what is legally stipulated for halbtrocken. A few producers still use feinherb to designate a wine between halbtrocken and fruity, like Selbach-Oster. Others have done away with all off-dry designations on labels, or at least front labels, for example, A.J. Adam. Some producers even avoid trocken, such as Immich-Batterieberg. It's often assumed that a Riesling labeled Kabinett (without trocken, halbtrocken, or feinherb) is the traditional, delicate near-dry style. Mosel wine lovers speak highly of these so-called classic Kabinetts, with the best examples having a wonderful levity and interplay of fruit, acid, and residual sugar. Yet this is only one style of Kabinett. There are also Kabinetts that are fermented dry or barely off-dry and are usually designated so. At present, the VDP, known as Prädikat Wine Estates, a leading growers' association with origins in the 19th-century natural wine movement (about which, more later), has been phasing out the terms "trocken" and "halbtrocken" for the Prädikats—Kabinett, Spätlese, and Auslese—in favor of keeping these predicates for sweet wines. The quality of a wine, in their opinion, should not only be measured by the sugar content of the grape at the time of harvest but also by its terroir. In other words, terroir should be the focal point. Nonetheless, the VDP's own classification model is constantly "evolving"—more towards Burgundy—and brings with it all sorts of qualifications, complications, and question marks. The model is structured like a pyramid. At the bottom are the basic entry-level wines (Gutsweine). Above these are the village wines (Ortsweine), followed by the single vineyards worthy of premier cru (Erste Lage) or, more often than not, the now higher-rated grand cru (Grosse Lage) status. (In 2012, Grosse Lage replaced Erste Lage at the top and should not be confused with Grosslage, the term for a large collective site—a deceiving category created by the 1971 German Wine Law, which needs to be banned.) In general, the ranking of vineyards is problematic, especially along the Mosel which has so many great sites. Grosses Gewächs (GG) is a VDP designation for its "best" dry wines that must come from a Grosse Lage and are usually packaged in an extra-tall, heavy embossed bottle—now with a new GG emblem since Erste Lage no longer applies to this category. In addition, the VDP has an eagle bearing a grape bunch on either the capsule or label and the wines are now grouped in one of the aforementioned designations of origin. Unfortunately, the majority of the "lesser" dry and off-dry wines from a Grosse Lage are stripped of their vineyard name and downgraded to either a Guts- or Ortswein—in many instances, a dumbing down of terroir, as some of these wines have great potential and reflect a specific vineyard site or even a demarcated section within a vineyard. But the VDP prefers the "one wine principle" for dry wines from a classified site. As many wine buyers still do not understand that Kabinett, Spätlese, and even Auslese can also be fermented dry or off-dry, the VDP has instructed its members, barring a few exceptions, to remove Prädikat designations from their dry and off-dry Rieslings and has set 65 grams of sugar per liter as a new maximum limit for fruity Kabinett. Put differently, the VDP is attempting, among other things, to create a specific taste profile and to support the assumption that the Prädikats always meant a sweet wine. While this is partly true in regard to the finest Spätlese and Auslese wines, today's wines are different and much sweeter than those before the 1940s, much less the 1920s, when the ability to stop fermentation did not exist. In addition, the sugar level of sweet Mosel Kabinetts from the 1970s and 1980s was closer to 20 and 30 grams of sugar. Today, sweet Kabinetts are rarely below 40 grams, which, Schildknecht says, "is well more than harbored by any typical Auslese before the 1970s." Now there's talk of the VDP taking off the vineyard name even for entry-level fruity Qualitätswein (formerly QbA) and Kabinett, as well. In fact, certain regional VDPs—for example, Rheinhessen—already have this stricture in place. This is difficult to understand, as Kabinetts, like their dry and off-dry counterparts, often show their place better than a higher Prädikat or a weightier GG does. And the latest official line from the VDP is that the Mosel can keep using the name of a Grosse Lage—the new VDP-only designation for the "best sites," similar to Burgundy’s grand cru—on labels that include "Kabinett." The Mosel wine expert Joachim Krieger is still a proponent of the outdated designation (Prädikat) system, especially Kabinett, and not just for sweet wines. He says that the system provides the consumer with valuable information about ripeness (without sugar added) and sweetness and allows the producer to accurately label the wines. Nonetheless, the predicates, along with the terms "trocken" and "halbtrocken," remain confusing for most people and have various negative connotations. Many of the top producers want to free themselves of this 1971 Wine Law straitjacket. What is more, a typical Mosel wine label from the turn of the last century just had the vintage, the village or village plus site name, and the bottler. Except for Auslesen, the wines were understood to be dry. The term "Kabinett" first became official with the 1971 Wine Law, and producers labeled wines with this newfangled designation beginning with the 1971 vintage, although J.J. Prüm bottled a 1970 Wehlener Sonnenuhr Kabinett. More on this later. Prior to 1971, Kabinett, in this sense, did not exist as a descriptor, much less on labels of Mosel wine, unlike the other designations that became better known according to the new wine law as "Prädikats." 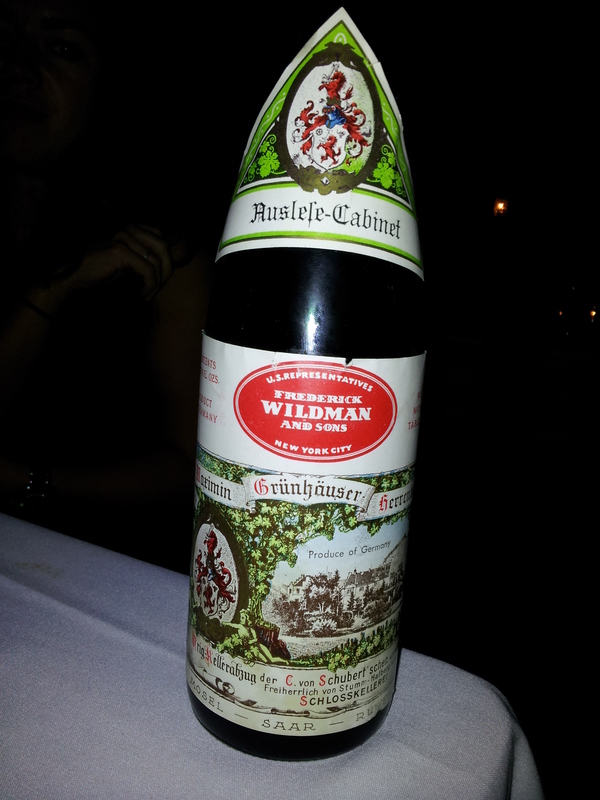 Moreover, Riesling was understood and did not usually appear on labels pre-1971 Wine Law. Cabinet [sic] should have been discarded from the wine vocabulary of the Moselle [after the enactment of the Wine Law of 1971]. Instead, surprisingly, with the new law it becomes embedded in it, for its use throughout the whole of Germany is now sanctioned. The word was introduced in the Rheingau, on the Steinberger Estate of the Duke of Nassau at Kloster Eberbach, in the early nineteenth century . The Duke has his own governmental Cabinet, and presumably wanted to pay a pretty compliment to its members. Understandably, the term Cabinet came to be used for quality wines of the Rheingau, once the part of the principality of Nassau. It should have no place on the Moselle, but should have been retained by those growers who have used it traditionally, and for wines like the famous Steinberger Cabinet. Schildknecht contends, "Loeb & Prittie's passage wrongly implies that before 1971, 'Cabinet' was only—or at least, somehow only 'legitimately' used in the Rheingau, and those claims are false and contentious. So one doesn’t really know whether the authors are railing solely against the use of 'Kabinett'—which term they neglect even to mention [in this passage]; or against the use of 'Cabinet' after 1971, in which case they are simply mistaken on the face of facts; or against the use of 'Cabinet' at any time in history for any wine save a Rheingau Riesling." By the 19th century, "Cabinet" and "Cabinet Auslese" were well-known designations for a prized wine, quite often made from dried, shriveled berries. And Schildknecht says that Cabinet spread beyond Rheingau to other regions in Germany, like Franconia, as well as to Austria and Hungary. Even today, many producers store their special wines in a separate small cellar room, or cabinet, known as a Schatzkammer. Carl von Schubert, the owner of the esteemed Mosel estate of Maximin Grünhaus in the Ruwer Valley, says that their former New York-based US importer, Frederick Wildman & Sons, requested the term "Cabinet" on a few of their sweet wines, such as a 1966 Maximin Grünhäuser Herrenberg Auslese-Cabinet. "If I remember correctly, the designation 'Auslese-Cabinet' has no tradition at Grünhaus," Carl says. In any event, the controversial 1971 Wine Law, which was initially framed in 1969 to replace the 1930 Law, created the current German wine classification, including the Prädikatswein system—previously called Qualitätswein mit Prädikat (QmP) until 2007—which links must weights to a hierarchy of predicate designations. In ascending order of ripeness, these are Kabinett, Spätlese, Auslese, Beerenauslese (BA), Trockenbeerenauslese (TBA), and Eiswein (110 degrees Oechsle, the same as BA). The predicates are not substitutes for a quality hierarchy, even if they are sometimes seen that way, even by knowledgeable consumers. Likewise, wine critics often give the higher the predicate, the higher the score. German Riesling is usually harvested at different stages, and thus at different levels of ripeness, or sugar content. Many of the finest German wines are from late-picked Riesling grapes, including those affected by noble rot—or Botrytis cinerea, a fungus that affects ripe grapes by shriveling and concentrating the sugars and acids—or frozen on the vine (Eiswein) to make sweet wines. Although classifying fine wines based merely on must weight was new, the historical basis for carefully selecting, measuring, and designating late-harvest Rieslings—in particular, at Schloss Johannisberg with different colored wax seals (now, colored capsules)—dates back to the late 18th century. In any of its variations, a Kabinett is meant to be lighter than a Spätlese and the grapes are usually picked earlier. In the mid-19th century, Spätlese, which means "late harvest," was a much talked-about method in the Mosel region of leaving healthy grape bunches to hang on the vine longer in order to achieve optimal ripeness and presumably better quality. During this time, many Mosel peasant vintners possessed small holdings with parcels more fragmented than is typically the case today. It was often too difficult or time-consuming to do two or more passes through the same vineyard. The large estate owners, on the other hand, had the resources to take the extra steps necessary by selecting overripe grapes and leaving healthy bunches to hang longer—though Mosel vintners, unlike those of the Rheingau, didn't seek botrytis, preferring instead to have pure Riesling aromas and flavors. By the late 19th century, Mosel wine was à la mode—brisk, light, and more often than not, dry. The Rheingau, by contrast, was still famous for its richer sweet wines owing to noble rot and maceration on the grape skins, which is avoided for nobly sweet wines today. In the mid-1980s, the late Bernhard Breuer of Georg Breuer and other leading Rheingau estates helped push the image and quality of dry-tasting Rheingau Rieslings via the Charta association. In a way, Kabinett has become today's Auslese. It takes a "selective harvest" to produce a light style of Mosel wine, as increased ripeness levels, result in higher alcohol and, for sweeter wines, higher amounts of residual sugar. Botrytis has been more of an issue in certain vintages (2006), too. Along with some other factors, much depends on the vintage, the location of the site, the age of the vines, and the time of harvest. A vintner can't just increase yields and harvest earlier to guarantee a satisfying result, even though some of the best-known producers of sweet Kabinett have quite high yields. "But I am trying to convince German growers is that they should save 'Kabinett' as a term for alcoholically light wines, period—regardless of their level of residual sugar," Schildknecht writes in a long reply to Mike Steinberger's "The Fate of Sweet German Riesling." In order to avoid the risk of re-ferment, any potentially active yeast has to be removed from the wine. Before the advent of sterile filtration in 1916, which first became more accessible to winemakers in the late 1950s, most Mosel wines fermented dry (called durchgegoren), but not always. * Because of the cold temperatures during the harvest, usually going into November or even December, some of the riper musts of the finest casks of Mosel Riesling (much like today) stopped fermentation with discreet amounts of sugar left over. In the old days, the wines matured a little longer in cask, but, even so, various types of filtering methods, such as kieselguhr, existed so that the winemaker could bottle a clear wine. Already in the late 19th century, the first so-called keimdichter Filter, or germ-proof filter, were even used to help stabilize a wine, but had the added benefit of letting the winemaker retain for the ripest wines, usually with botrytis, a small amount of residual sugar. Today, most residually sweet wines are chilled, then taken off the yeast, before being sulfured and filtered. In other words, every wine could now be made sweet by stopping fermentation and using a Entkeimungsfilter, or sterile filter, which was fairly new before the 1950s. In 1958, the term "durchgegoren" was supposed to be put on labels to indicate a dry and therefore "natural wine." This notion of naturalness was different from unchaptalized. Christian Schiller, a blogger who at Schiller-Wine, insists that all Rieslings—in particular, from the Mosel—would ferment completely dry if the winemaker didn't intervene to arrest fermentation. Of course, this is not the case. In fact, winemakers can't always get their Rieslings—especially with today's higher must weights—to ferment to legally trocken (under the arbitrary 9 grams of sugar per liter) without warming the tank, adding selected yeasts, or blending wines. On top of this, many a winemaker feels compelled to make a wine trocken, even if the batch in question might have tasted better at its natural stopping point because clients, especially in Germany, insist on dry. A dogma that Schildknecht coins "Trockenheit," or dryness, especially in regard to his critique of the VDP's GG category. Before the 1971 Law was enacted, unsugared wines—that is, the present-day Prädikatsweine—were labeled Naturweine ("natural wines") or naturrein (“naturally pure"), as opposed to the verbesserte Weine ("improved wines")—i.e., sugared wines. This is different from today's natural wine movement, which believes, among other things, in organically grown grapes, native yeasts, and little or no-added sulfur. In addition, a Naturwein could only be applied to an estate-bottled wine, usually labeled an Originalabfüllung ("original bottling"), or one of its variations, such as Original-Kellerabfüllung or Original-Kellerabzug. Wachstum ("growth of"). This designation was often listed before the name of the grower, indicating just how important it was. In other words, a natural wine had to be unsugared and bottled by the grower. From the latter half of the 19th century until the 1971 Wine Law, various terms, like Natur, provided a marketing tool for purity. In fact, the VDP was formerly called Verband Deutscher Naturweinversteigerer (VDNV), or the Association of German Natural Wine Auctioneers. The term "natural," however, was prohibited after the passage of the 1971 Wine Law. The addition of sugar to the fermenting must, called Anreicherung, or chaptalization—named after Jean-Antoine Chaptal, who advocated its use in 1801—increased alcoholic strength and helped make a palatable wine. It's a common practice in France, including in Burgundy and Bordeaux. Because of successive poor vintages in the 1840s, Mosel vintners in dire straits looked for other ways to improve their wines that would otherwise taste sour. It was during this time, in Trier, that Ludwig Gall introduced a technique of adding both sugar and water to unfermented grape juice, called Naßzuckerung, later known as Gallisierung, or Gallizing, to counter under-ripe, high-acid Mosel grapes. In the ensuing years, a movement rose up against sugared water with subsequent wine laws (1892, 1901, 1906, 1930) put in place to protect "naturally pure" wines. It was, in part, a response to oversugaring (usually with water) and other perceived adulterations. In particular, the Saar, of all places, had some of the most militant advocates of unadulterated wines, or "natural wines," despite the cooler clime, which makes ripening even more difficult to achieve. As for Joh. Jos. Prüm's 1970 Wehlener Sonnenuhr Kabinett mentioned above, Manfred Prüm says that with the 1971 Wine Law, it was forbidden to use the traditional designation of the highly regarded Naturweine with either Original-Kellerabfüllung or Wachstum on the label. Instead, it was replaced by the term "Kabinett." "In the interim period, before the 1971 Wine Law was put into force, we had the opportunity to use this designation already for the late-bottled 1970 [Kabinett] wines," he says. "We used this opportunity to help our customers prepare accordingly [for the transition]." Some have argued that dry Mosel Riesling, especially a Kabinett trocken, tastes shrill and sour and most good examples of Kabinett require a certain amount of residual sugar for balance. There's no doubt that many dry Mosels tasted so and still do today, but certain producers long made impressive dry Rieslings, ranging from the rich, lees-enriched but finely etched libations of Markus Molitor to the bright, unapologetically incisive, frequently 10- to 11-percent alcohol examples from Ulrich Stein of Weingut Stein. On the other hand, the "sweet wave" to which German growers often (usually derisively) refer, and which (depending on whose version of history you credit) began in the late 1950s or 1960s, gave us plenty of plonk. Many of the wines tasted over-sulfured, poorly sweetened with Süssreserve (a par-fermented or unfermented grape juice added to a finished wine to sweeten the taste—a method otherwise out of favor among most quality-conscious winemakers), and, worse, marked by sorbic acid, an additive once popular in killing off yeasts for making sweet wines and whose odor is akin to geraniums. It was and still is used as a last-ditch preservative. In Germany, dogmatic advocacy of dry wine was not always the default position. After the Second World War, the fashion for making sweet wines gained ground with the ability to arrest fermentation along with other advancements in winemaking technology in the ensuing decades. By the 1980s, this began to change, especially after the 1985 glycol scandal in Austria, which hurt the market for German sweet wines and spurred the Austrians to focus on dry ones. Over the years, German wines have nonetheless been pigeonholed as sweet in the United States. A bandwagon, however, started building for GGs within the VDP in the last several years. US importer Rudi Wiest, who only represents VDP estates (except for Mönchhof, which is no longer a member), seldom offered any dry wines before this movement, but now backs the category with gusto. The popular American importer Terry Theise, who prefers residually sweet German wines, has also increased his share of dry German Riesling in recent years. Much of the German wine press actually favors residually sweet Mosel Rieslings. The American Joel Payne of Gault&Millau Deutschland has also been a long-time supporter of sweet Mosels and laments the "drying out" of many VDP estates' offerings. Over the years, one of Trier's top chefs, Hubert ("Hubi") Scheid of Schloss Monaise, specializes in serving for his guests fruity and nobly sweet Mosel wines with bottle age, like a Piesporter Goldtröpfchen from Reinhold Haart or Bernkasteler Doctor from Wwe. Dr. H. Thanisch – Erben Thanisch. Many of us learned to appreciate fine German sweet wines first and do not want to see this relatively modern style disappear. In a book about the history of the VDP, Daniel Deckers shows us a wine list at Antoine’s Restaurant from 1940. Antoine’s, an institution in New Orleans since 1840, lists a page of “Moselles” with the description: “FRAGRANT, EXTRAORDINARILY DELICATE, the wines of the Moselle (which, incidentally, are produced at about the latitude of Winnipeg) are the lightest fine wines in the world and because of their dryness go very well with seafood. As a rule, they are at their best when less than ten years old.” Their list includes the following wines, all Original-Abfüllung: 1935 Eitelsbacher Karthäuserhofberger (Rautenstrauch), 1935 Scharzberger (von Hövel), and 1920 Bernkasteler Doktor (Wwe. Dr. H. Thanisch), among others (Im Zeichen des Traubenadlers, von Zabern, 2010). For some people, truly great dry Riesling only comes from Austria and Alsace. And if Germany is mentioned, then only the Nahe, Rheingau, Rheinhessen, or Pfalz. Yet the distinctive and invigorating dry to off-dry Mosel Rieslings—and not just those labeled as Kabinett—with their mineral aromas, delicacy, and piquancy are one of the region's calling cards as they once were during the Mosel's heyday in the late 19th century. Portions of this post appeared in similar form on the blog of the former Mosel Wine Merchant, April 15, 2010. *At the Seitz-Werke, the chief chemist Friedrich Schmitthenner created the first sterile filters for wine in 1916. These were sterilization, or Entkeimung (EK), filter pads made of asbestos and cellulose that enabled low-alcohol wines to be bottled with residual sugar and without the fear of bacterial spoilage. In 1891, Theobald Friedrich Seitz, who was a former wine merchant, made his first wine filter and established his company in (Bad) Kreuznach, where he later appointed Schmitthenner in 1913.